I’ve been critical on this blog on certification as a means to mainstream sustainability in production systems. And I can’t help myself: there are just so many naive and downright idealistic assumptions driving the uptake of certification at the moment, that it has lost much of its’ business sense. In this post I will show how the system of certification as we know it is ripe for disruption, and I will end with some alternatives from which I can see that they are working on upending the system of certificaiton as we know it. There are two methods currently applied to convincing producers to stick to sustainability standards. One is by sheer market power, by making standards a prerequisite for supplying. Competing firms downstream collude and impose a standard on the supplying market. The other is through what is called market development: you align big companies on a voluntary basis to voice demand for a certain voluntary sustainability scheme, and then on the other side of the market sponsor as many producers as you can to adopt the certificate, praying that this will be sufficient to reach a systems tipping point where everything is responsibly produced. Now all these points above are variables to an equation, and that equation must solve the puzzle of mainstreaming sustainability. But the number of combinations and permutations an entrepreneur can make amongst these variables for organizing a sustainability mainstreaming trajectory are mind boggling, and downright confusing. As if running a business wasn’t hard enough in itself, now the entrepreneur needs to find some kind of meaningful balance between these variables to show to customers that a product is responsibly produced. What sustainability message does this product communicate? Why do you need three labels? And why these three labels and not some other label? help producers to compile new value propositions to their buyers, which can potentially command a premium in the market. Certification as it currently is, does neither. In their competition amongst each other for consumer recognition and attention, product labeling organizations are at the same time competing with brand identity. I even heard Unilever’s CEO Paul Polman slip out during a seminar organized by the Guardian, that there is at some level a conflict between brands and certification, because there is a limit to what certification can communicate on sustainability and what the brand can communicate itself. This is particularly so for smaller and medium sized enterprises, who because of their size, operate on the basis of more close relations with their suppliers and buyers. They therefore know more about what needs to be done to achieve sustainability in their business system, than any certification scheme could possibly par. 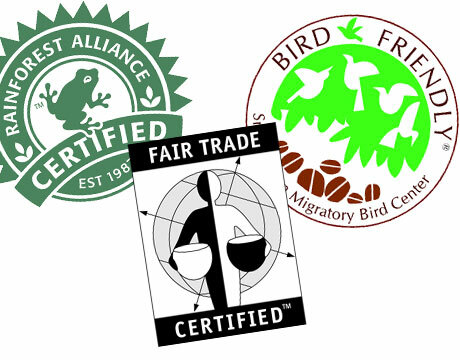 As for producers, the value proposition of certification is very blurry and highly circumstantial. There are many opaque projections on the value of certification as for instance the one compiled by KPMG on certification in cocoa production in Ghana. What will arise from the disruption rubble? Of course the question is then what the alternatives would be that could disrupt the industry of certification. I see two trends that will achieve this, the first is simplicity of the mechanisms of certification. The second is refined market-based mechanisms that create a basis of consumer market adoption of sustainably produced products. Regarding simplicity, the trend is best conveyed through pole and line fishing certification. This is a very concise way to communicate that fisherman are not depleting the ocean’s fauna with industrial fishing trawlers that scoop every living thing out of the ocean. The pole and line fishing certificate parsiminously communicates about the the probem and the purpose of the certificate, namely to counter over fishing by huge trawlers with individual fisherman holding poles with lines on them, lifting out their catch, one by one. This is easy for the consumer to understand, easy for the fishermen to adopt and (importantly) easy to inspect for the auditing agency. It is contrary to the more complex certificates, like organic, where a recent New York Times article explains that organic certification does not tell anything about conduct of the producer regarding sustainability. The point of consumer market adoption of a sustainability brings me to the Tip4Change venture, which I’m advising at the moment in seed phase. Tip4Change is a venture that does not impose a single standard on producers. Rather “Tip” attempts to create a market for the most responsible product, between consumers of sustainabe products and the producers behind the product. The idea is that consumers can reward what is in their opinion the best and most clear sustainability proposition by tipping the producers’ initiative (eg. community development programs, wildlife conservation, etc) at the till. This market intends to provide a clear selection mechanism for determining the stronger from the weaker sustainability propositions. At the same time producers can learn from the best initiatives, and take their shot a trumping the leaders. Brands can also leverage this, by actively profiling themselves with those producers whom they consider to be sailing the sustainability flagship. In all, Tip4Change could provide a more simple, transparent, and less costly alternative to certification as we know it, with market uptake as a clear indicator of what works and what doesn’t. The “Tip” system intends to reveal those standards that are right at the level of what consumers can grasp regarding sustainable consumption. And “Tip” is not the only venture out there which is working on possible business models that can bind producers and consumers in this way; it has a couple of competitors! All an indication that certification’s disruption process is currently taking place. Previous PostPanera Bread’s “pay what you can” business modelNext PostJust what is Shared Value? Reblogged this on Más allá de hablar de Sostenibilidad y RSE.